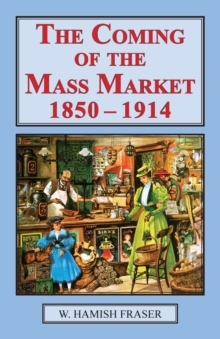 This famous and comprehensive study presents the causes and effects of the 'mass market' revolution between 1850 and 1914, which led to our 'modern' world. The changes were unprecedented, extraordinary, democratic, and wide-ranging. They affected everyone. They still do so. This is a fascinating and wide-ranging account of the evolution of the 'mass' market consumer. And of the evolution of the retailing and leisure industries, with the enormous changes they made in the daily lives of the people. The author draws on much detailed contemporary economic and social data - including detailed family budgets - to demonstrate what happened. Professor Hamish Fraser shows that the standard of living of the British population rose in the late nineteenth-century as better health care and the new supplies of better foods, competitive prices, and new distribution methods had a dramatic impact on living standards, and on the extent of life itself. What had been luxuries became necessities, too; what had been scarce or exclusive - such as many exotic fresh fruits from abroad - became commonly available. Professor Fraser examines the social and economic causes and effects of this ongoing 'revolution'. For the first time most British people were able to buy better food and clothing. They gained access to better health care, and to many new goods and services, including new leisure opportunities - in many spectator and participatory sports, in seaside trips, and in such things as tickets for the popular music hall. The demand in the 'mass' market had an important impact on living standards, and with its effect on retailing and production. New multiples and department stores offered more efficient distribution. Competitive pricing was the 'norm'. Widespread advertising was introduced. The advent of canning and of refrigeration - together with cheaper and faster rail and ship transport - brought many new products to Britain to meet new 'mass' demand. The impact of rapid American and Germany industrial growth impacted on what was provided, and at what for many were affordable prices.